hahha that would have been unexpected. My first thought would have been it was a real gun too, although I’m smart enough to check it before I pull the trigger on something I am handed. Yes blanks have and will kill people, but it seemed to work out alright in this case since he actually shot toward the corner where they planned. The problem lies where you try to “prank” someone with something like this and they mess around and put the empty “airsoft” gun to their head as a joke and pull the trigger. When are people going to realize everything these kids do is F-A-K-E.
From the fake snot hanging out of the nose to the pretend accent…come on people. They are doing it for the views, and a lot of people are buying into it. Of course its fake but Im pretty sure this prank was real. The “prank” is for the views. Have you ever held an air soft gun compared to a blank firing gun? Or even a air soft vs a BB gun? Lets get serious here.. If you think that guy can honestly tell the difference between two fake guns I think you are giving him WAAAY too much credit. Dont worry about Krispy because… He. Is. The. Baddest of them all. He also has 400 cars, scars, guitars, houses, and mouses. 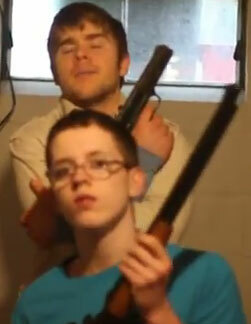 Krispy Kreme is actually a damn good rapper, and the valedictorian from his high school. Go to youtube and search krispy kreme aka Tyler Cassidy and you’ll find pics and vids of his yearbook, him being normal, and some of his old serious rap songs that he is spitting crazy on. Im a bit bummed Krispy is a schtick, but this dude Tyler is a smart cat. I’m gonna guess there is some stupid law against abortion for some one that old…..